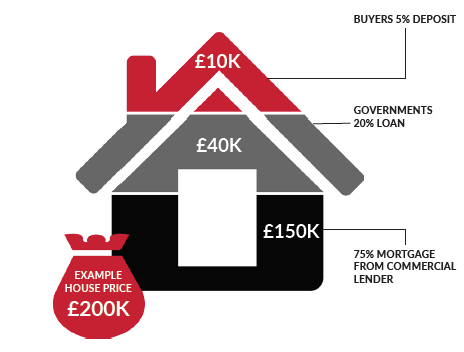 Many people may still not be aware of the government led Help to Buy scheme. The scheme was first announced in the March 2013 Budget as part of an initiaive to primarily help first time buyers get a foot on the property ladder, aiming to assist anyone struggling to save a deposit for their first home or move up the property ladder if they have limited equity. However, in 2016 it was announced that the scheme was being withdrawn in 2020 – so there is no better time to start the process of your new, or first, property purchase than right now. But how do you pay back the loan, you may be wondering? Well, for the first five years of ownership you are not required to pay back any interest on the 20% loan you receive. Most importantly though, you do not have to sell your property, or resort to bank loans to pay it back. More often than not, remortgaging is the most popular method of paying it back. If you are not sure whether Help to Buy is an option for you, then please get in touch for a personal no fee consultation.